Friends, You can now Create Gmail Account Without Mobile Number easily without much stress, In olden days, We don’t have to verify mobile numbers, This feature was introduced by Google inorder to prevent hacks and hijack of the Gmail accounts. This feature became a problem for some people. People, Do like to have multiple Gmail accounts, As Google provides lots of stuff with one google account, But the mobile verification is a big problem, So in this article, we will guide you to Create Gmail Account Without Mobile Number or verification, Nothing is needed, Just simply follow the steps. 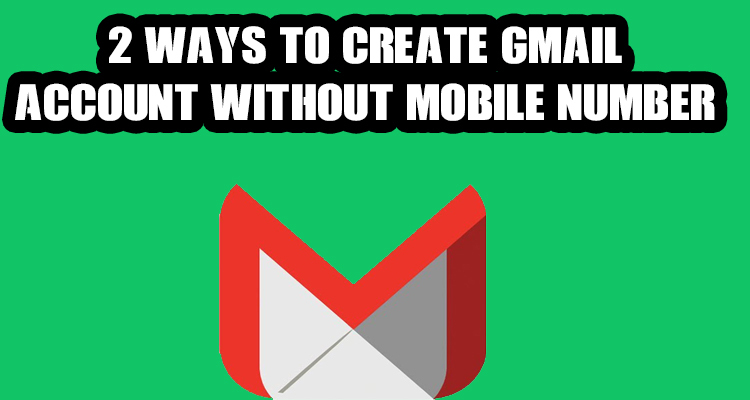 There are two ways to create Gmail accounts without Mobile number. Create Gmail Account Without Mobile Number With Google Chrome. Google Chrome is one of the famous browsers used Worldwide, People can get a new Gmail Account by making use of Google Chrome’s Switch people option. Follow the steps mentioned below carefully. First, open your chrome Browser on your computer. At, The top right corner, There will be your name displayed or something is written in it. Click on it, Click Switch Person. Then Popup windows will open, Click add a person. Add the name of the new person. Choose an image and click save. Then again tap the above button, The name of the person will appear in the top right corner. Click on it, Press sign into Chrome. Then Click more options, Click create new Gmail account. When it asks mobile number, Just press skip. Now, Finish the process of registration. That’s it buddy, You have done the process of registration, And a new Gmail account is created without any mobile verification. This is the first way to create a Gmail account without mobile number. Don’t worry if you don’t understand the above steps, I included a video bonus. Note – By Verifying Mobile, Your Gmail Account Will Be safe from hackers, Non verfied mobile accounts are always vulnberable. This method is simple than the above method, Because nowadays everyone having smartphones in their hand, Follow the steps carefully. Go to settings in your Android Mobile. Then click add a Gmail account. When it asks for mobile verification, There will be a skip option, Just opt it and you will be done with your registration process. Maximum 8 accounts can be made per day. Clear caches and other things when you made 3 accounts. If you exceed the limit, All the accounts would need mobile verification to access it. NOTE – The created Gmail accounts without password won’t ask for mobile verification until you not login with proxies or different country IP and if you are signing for any one of the google products, Google verification is must. I am attaching a video bonus, People who didn’t understand the above steps, Please watch and learn and make the most of it. So, Guys, I hoped you would have enjoyed this article and learnt how to Create Gmail Account Without Mobile Number, Always verify your Mobile number for much more security, Stay tuned for more articles, Tips and tricks like this. Share this articles with your friends, So that it might help them.